The nation needs a government backed investment bank to secure capital at reasonable interest rates for development of advanced nuclear reactors. This blog post describes the kinds of mechanisms that could be developed to provide the capital and financing sources that are the missing links in the chain of events that need to be completed for nuclear start-ups to get the one thing they need most – customers. There is a whole ecosystem of nuclear startups that believe they can build a better reactor, and faster than ever before. Designers of advanced nuclear reactors seek to bridge the gap between concept and prototype. While it is too early for investors and potential customers to easily pick winners from an increasingly crowded field of advanced reactor projects, new patterns of investment, including public/private partnerships, are creating opportunities for entrepreneurial developers. I have come to the conclusion that all the so-called “happy talk” and congressional testimony about advanced reactors isn’t driving money into the hands of startups. Also, I am convinced that unless they have investors with lots of patience and very deep pockets, like TerraPower’s deal with China, that the most “product” some of them will ever develop, after long development time lines, are paper designs and maybe some intellectual property that can be sold to cash out the VC or angel Series A investors. This is an unacceptable outcome to their investors and to the technologists who are committed to bringing their visions of a new generation of nuclear technologies to physical form. The focus of a nuclear investment bank, in this view of it, is on firms that have passed through their initial conceptual development work and and have real prospects for producing a feasible design. Also, they need to have established viable partnerships, as startups, with much larger partners/potential customers, to take their work to the next stage. The example that comes to mind is X-Energy’s relationship with Southern Nuclear. However, not every utility is as bullish on nuclear start-ups as Southern. In fact, many are adverse in varying degrees to the idea of this kind of partnership due to their mixed portfolios of nuclear, coal, gas, and renewable energy generation technologies all competing for capital investment dollars. Stockholders seeking maximum return on investment, in markets that values quarterly earnings reports, appear to have little patience for the time it takes to bring a new reactor design to market. 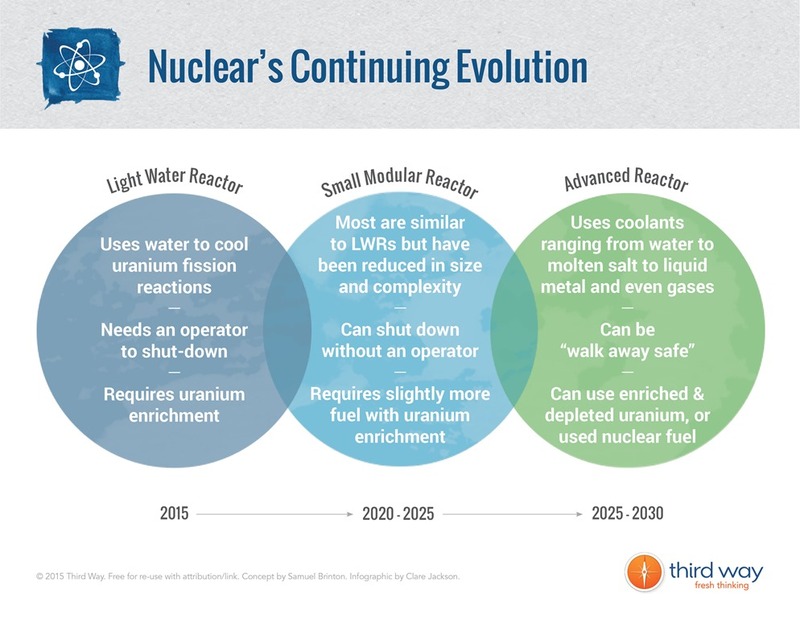 The exception, so far, besides Southern, is UAMPS with its commitment to NuScale’s SMR now targeting an NRC license submission by the end of this year. Even TVA is cautious having backed away from a ground breaking relationship with B&W to design and license a 180 MW SMR. Instead, the quasi-government utility has opted for a technology agnostic Early Site Permit that has a shelf life of up to two decades. The “bank” would have multiple roles. As a quasi-government corporation, it would raise funds by selling government bonds against a debt ceiling authorized by Congress. This financial arrangement would buffer the bank from the volatility of the annual appropriation cycle. Here’s a short list of possible investment vehicles. The list is expressed in general terms. Financial experts would need to work out the details. Series A funding for start ups perhaps in partnership with VC firms. The money would be repaid once more significant resources are found producing the possibility of a revolving fund of $1-5M investments for start-ups. Cost sharing grants (50/50) for technical design and development of license applications. Investments in permanent test facilities, with flexible infrastructure and configurations, to be used on a cost-reimbursement / grant basis by nuclear start ups to prove the viability of fuels, materials, and components. Finally, DOE needs to do a much better job at due diligence to avoid another Solyndra type scandal which appears to have been driven in part by political deals cut at the White House. DOE is to be commended for having taken several important steps in promoting financial futures for startups. It created the Gateway for Accelerated Innovation in Nuclear (GAIN) which includes the Nuclear Voucher System for small grants to start ups. It awarded loan guarantees to cover $8.3 billion in costs for the twin Westinghouse AP1000 reactors at Georgia Power’s Vogtle site. It awarded two large grants worth $40M each to developers of advanced nuclear technologies. It funded a cost sharing agreement with NuScale to support design and licensing expenses for its 50 MW SMR. So what’s missing? The financing strategy is piecemeal. It lacks broad congressional support, and the Obama White House, a reluctant sponsor of these programs for much of its eight years in office, never pushed for an integrated program of policy objectives and financing tied to nuclear energy as a key technology to address climate change. On September 22 the Secretary of Energy Advisory Board (SEAB), composed of senior level experts from industry and government, published its final report on the future of nuclear power. 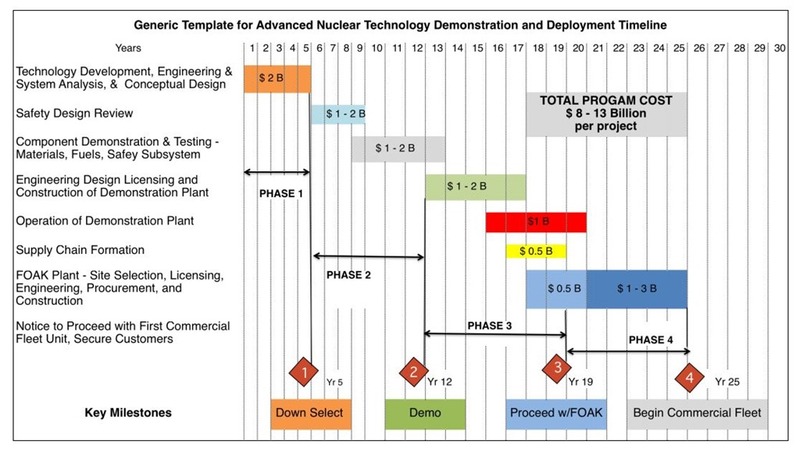 In its report, and accompanying slide presentation, SEAB identified the huge costs needed to build a first of a kind (FOAK) advanced nuclear reactor, and the time frame to complete one for commercial deployment. The chart below from the report shows that total program costs for as single design could be $8-13 billion over a period of up to two decades. The SEAB report is unnecessarily cautious, and like TVA, seems to want to bask in the reflected light of market options that might never bear fruit. The government and the industry must come up with better numbers. These types of prognostications represent a kind of thinking that harks back to the lumbering progress of national labs decades before there ever were any nuclear start ups or the Internet. The government needs to learn from the start-ups with their focus on rapid prototyping, modeling in super computers, the blazing speed of web enabled communication, and public / private partnerships with new lab organizations like GAIN. DOE seems to have the idea, at least as embodied in the SEAB report, that one design fits all and that taking a “moonshot” approach to it will solve the problem. Rothroack says this isn’t the right approach. Instead, the government ought to think in baseball terms, and that is that the more “at bats” you get, the more times you are likely to get a hit, get on base, and score a run. This means placing many “bets” on a variety of designs to see which ones which ones will fail quickly and which ones can go the distance. But he also says its recommendations must be and it can be done even faster if we are to have any chance against climate change. He points out that China is planning to deploy advanced reactors in 2018, so clearly this is less of a technology barrier than just a decision to do it. Russia is also placing many bets on advanced reactor R&D and has connected one of its advanced reactors, with its new fuel type, to the grid. A government bank that provides funding at various stages of maturity for many different types of reactor start up efforts would be consistent with the concept of placing multiple bets to find out which ones would have the greatest potential to get the one thing they all want – paying customers. Your fascinating idea for a “Nuclear Energy Investment Bank” is one that I also discussed…back in 2009 when I was blogging more extensively on the Daily Kos. http://www.dailykos.com/story/2009/07/09/751817/-How-to-finance-new-non-carbon-alternative-nuclear-energy I had several entries on this as I developed the idea. My idea as I developed it was slightly different in emphasis that yours. Where my idea dedicates *some* of the revenue to SMR/Gen IV reactor R&DD (Research & Development, Deployment) most of it was to kick start Gen III reactor financing to solve the problem of high rate increases for ratepayers before and during the 6 or 7 years construction time it takes to put an AP1000 online (or whatever Gen III reactor). The idea is to build up a $100 billion fund for the bank that can be lent to a few projects each year. After, and this is very important, the rate increase could kick in to pay for the plant’s debt to the NNDB so that consumers would actually be getting something for their rate increase. At very low interest rates (I think my idea was the top rate would be 4% but 2 to 3% would be the norm) eventually the bank would be self sustaining and it’s fund would grow based on a combination of payments back into the fund along with possible equity stakes for an actual part of the revenue the plant would develop. I see the payments starting to come in after 7 years of first loan when a unit goes COD. As more units come online for COD, then the banks fund would start regenerating and, at some point, start paying the Fed/Treasury back for the initial outlay of funds. There would be a huge initial Congressional grant of the ~$100 billion…maybe like ~$25 the first year, 50 the next etc. The idea is to remove nuclear deployment from the vicissitudes of finance capital’s varying and often high interest rates. I also had a sub-investement in establishing a combination of nuclear engineering universities and/or bulked up Depts at major universities with tuition grants to students under graduate through Ph. d level as well. Anyway, it’s nice we are thinking along the same lines!